NIS Chief Executive dispels certain myths surrounding the Russian satellite navigation system. The GLONASS satellite navigation system is an unusual project. On the one hand everyone has heard of this system and they are familiar with its main features, but on the other hand few Russian high-tech start-ups have attracted so many rumours, misapprehensions and even jokes. 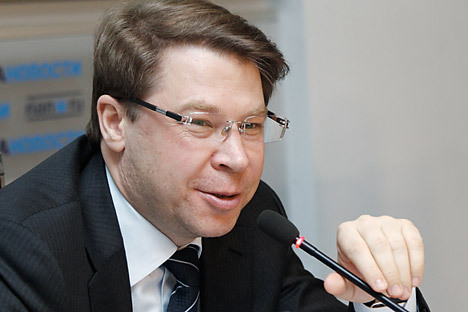 Navigation Information Systems (NIS, formerly NIS GLONASS) Chief Executive Alexander Gurko attempts to dispel some of the myths surrounding this system. Why do we need GLONASS if the whole world is using GPS? A user can solve the same problem - that of finding their location on a map by using signals from both GLONASS and GPS. The Russian and American systems are on par. There is no motivation for the customer to simply exchange one system for another. The situation is changing if equipment is used that is able to receive and process signals from both systems. Moreover the user gains a significant advantage both in terms of the speed at which the co-ordinates are processed and their reliability: for ‘standard’ urban conditions this increases from 60-70 percent up to the maximum of practically 100 percent. In this case the operator of the navigation system - for GPS this was and remains the Pentagon - has the option of either switching off the civilian signal for a specific area or of desensitising it artificially. The latest generation of GPS satellites also support this function. This is not even about military conflict, as the threat of turning off the ‘navigation switch’ can in itself be used to achieve political or economic aims. Therefore it is just a small step from a technological dependence on a narrow satellite navigation field to economic, political and military dependence. The critically important infrastructure that the entire world uses and on which a significant portion of the national economy is based should not be reliant on one country. In Russia the dual GLONASS/GPS navigation system is accepted as the state standard, that is to say it is compulsory for all state applications and for ensuring security. Russia has claimed more than once that GLONASS is the only alternative to GPS - how does this correspond to reality? This is true of today. The situation though will change in the course of the next three to four years. The Chinese Beidou system at the moment operates as a regional system (that is to say it supplements GLONASS and GPS) within the limits of the Asia-Pacific Region. The European Union has begun to deploy the Galileo system. In the absence of some kind of force-majeure, both these systems will be deployed globally in the next few years. This however is the problem for the pioneers. Both GPS and GLONASS were developed in the 1970s and they do not take into consideration all the modern technology. Galileo and especially Beidou were designed decades later, which allowed more modern and more technically advanced systems to be developed. The GPS and GLONASS systems are being modernised but this process takes longer and is more expensive in as much as operational orbiting satellites have to be gradually replaced with newer models. It is often said that GPS is significantly more accurate than GLONASS. Is there any truth in this? If a GPS receiver can theoretically fix a position in an exposed location to within no more than 3-4 metres, for GLONASS, this figure is within 7-10 metres. This theoretical difference is not important in practice for two reasons. The first being that there are no receivers that support just GLONASS and not GPS, and the second is that the client’s receiver will normally carry out additional signal processing, averaging out the result. For example if a car travels along a perfectly straight road the trajectory of the vehicle’s motion in terms of satellite navigation data would look like a fairly intricately broken line, with a large number of random deviations. In this case the system’s software fixes this line onto a digital map and as a result the screen displays the self same perfectly straight road that exists in reality. How can the accuracy of GLONASS be improved? Positioning accuracy can be improved with the help of both satellite and ground based infrastructure. Today a wide-area augmentation (Sistema Shirokozonnoy Differentsialnoy Korrektsii SDKM) system is being developed in Russia. Corrections will be sent to the SDKM via a satellite communication channel from ‘Luch’ satellites in geostationary orbit. The accuracy of the coordinates will increase to decimetres. But the user (should anyone require that sort of accuracy) will need to fit special modems, which are able to pick up the satellite signal. There is an alternative - without a satellite, but for this you would need around 300 differential correction base stations located in the most developed corners of the country. This variant could ensure millimetre accuracy for a fraction of the cost.